The second leg of Michelangelo Antonioni’s so-called “Alienation Trilogy” picks up pretty much where L’Avventura left off with La Notte. Though unrelated to its predecessor in plot, the themes and relationships circle the same areas: lovers don’t love each other, industry and capitalism encroach upon human decency, ennui consumes the wealthy, and everyone seems lost in the modern world. If anything, La Notte is more personal than L’Avventura, and in some ways more difficult. During exchanges like these, Lidia struggles to keep her emotions alive. Stuck in a loveless marriage and surrounded by ironic detachment, she seems to be the last person alive with any humanity left. She may be afraid and confused, even if she can’t summon the energy to be angry anymore, but at least she feels something. When she and Giovanni visit a dying friend in the hospital, Lidia excuses herself because she can’t stand to watch him decay. Giovanni stays, seemingly because he is stronger than her, but really because he is so emotionless that the situation just doesn’t affect him. At almost every turn, Antonioni invites us to see Giovanni as a stand-in for himself. A highly regarded artist, Giovanni becomes the talk of the town shortly after his latest book is released. Equally hounded by intellectual and wealthy circles, everyone wants to show him off, as if his cultural cache will rub off on them. As he walks into a bookstore for a signing, he stops to ponder his books on display. Antonioni creates the image of a man isolated by his popularity, imprisoned by the expectations and obligations created by such success. During a wealthy industrialist’s party, Giovanni is carted around by his host like a show pony. He wades through obligatory compliments made by other guests. One of them, a woman named Remsey, insipidly proclaims herself “his biggest fan,” while others seem to know nothing of his work other than its reputation. At one point, Remsey corners him with her own idea for a story, about a woman who sacrifices her happiness for the man she loves. “But why?” Giovanni asks. “She just does,” she answers, “It makes me want to cry.” It’s a comical exchange, but it reveals the contempt that Antonioni has for faux-intelligent fans. There is also a deeper accusation, one aimed as much at the artist as the audience. Remsey holds the childish notion that sadness equals artistry. She seems to have a shallow approach to her appreciation of art, so if she truly does love Giovanni as an author, what does that say about his work? Not to put too fine a point on it, but is he really a great artist, or is he simply exploiting the modern ethos of alienation? Probably, like Antonioni, he falls somewhere in between. In La Notte, Antonioni suggests that a world existed before the vapid one in which he lives. There was a time before everyone fell in love with their own neuroses, before self-centeredness was a model of behavior, before people adorned themselves with detachment like they would jewelry. It was also a world before the reign of unfettered capitalism, before the construction of skyscrapers caused the deterioration of neighborhoods. In this not-too-distant past, the film somewhat dreamily suggests, emotions could be sincere and love could be selfless. Now that those days are gone, society has become a vacuous, cynical sphere, and while Antonioni seems perfectly aware of his own contribution to stylish cynicism, he seems unable to stop himself. In criticizing his culture’s fashion of isolation and emotional hollowness, he has created the bleakest of films, absent of the least amount of hope. That is not to say that the film itself is empty. It is a quiet sigh of despair where even a sunrise is ironic, underscoring the emotional devastation of his characters. Antonioni alone did not kill sincerity. Obviously, he is part of a larger cultural monster that revels in gloom. 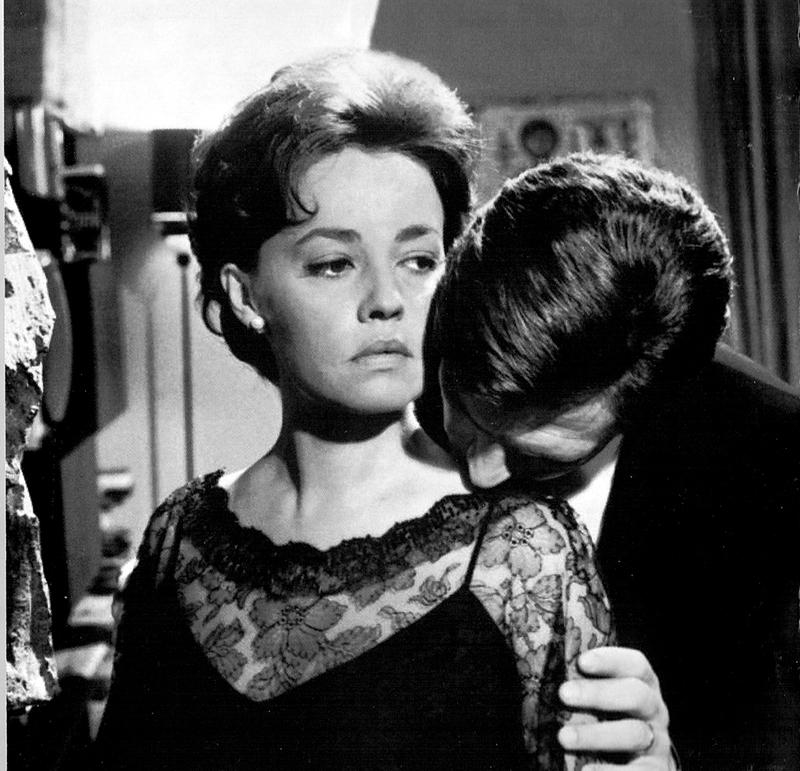 La Notte serves as evidence of cynical chic more than it consecrates it. However, some of his contemporaries in world cinema – Fellini, Bergman, Wajda – covered similar intellectual ground and found more invigorating ways to discuss the same themes. At times, La Notte seems more like an exercise in narcissistic cynicism than a film about it. I also forgot to mention Antonioni’s incredibly sophisticated use of sound in “La Notte”. He frequently uses sound to counterpoint or mislead us from the visuals, including the scene where Mastroianni and Moreau first enter the party and initially can’t place the rumble of the crowd. I think I like “La Notte” slightly more than “L’Avventura”, although there are deep similarities between the two films. 1) There is a brilliant use of reflections in “La Notte”, including one stunning shot where Mastroianni watches Monica Vitti (in a black wig this time) playing shuffleboard, and then steps into the room as we realize we’ve been watching a reflection the entire time. 2) Antonioni has the most simple and elegant camera moves I’ve ever seen. Many directors like Minnelli or Scorsese use crane and dolly shots as showy visual flourishes, but Antonioni’s movements are completely graceful and restrained, and usually quite contained. One of my favorite shots in the film is of the party band continuing to play as the sun dawns, while the camera cranes up so slowly it is almost imperceptible. 3) Both films open on scenes of new building construction, and yet both end on a note of near-apocalyptic dread. Perhaps the suggestion is that if a new society is being built by people this vapid and detached, it’s tantamount to a cultural death rattle. 4) In both “La Notte” and “L’Avventura”, the male character is an artist who is tempted into selling out. 5) I am finding more of Antonioni’s influences in subsequent works by other artists as we go through the festival (the terror and alienation of Kirsten Dunst in Lars von Trier’s “Melancholia” is not that far removed from what Jeanne Moreau experiences here), but there is one that may not come immediately to mind: the TV show “Mad Men”. We do know that Don Draper is a fan of 1960’s arthouse cinema, he’s a man alienated from his own identity and the people around him, he’s an artist in an industry that forces him to sell out, and much of the last couple seasons of the show have used silence, despair, and Antonioni-esque visual severity to great effect.